(PRLEAP.COM) SAN DIEGO – October 09, 2014 – GreenRope, a leading CRM and marketing automation platform, recently partnered with the San Diego Chapter of the American Marketing Association (SD AMA) to power their CRM and email marketing initiatives. "The San Diego AMA is grateful to GreenRope and their dedicated team for their partnership and commitment to the San Diego marketing community," said San Diego AMA President, Shelley Callahan. "We look forward to working with their team and their robust CRM platform to reach even more people in our community." The SD AMA is saving both time and money by switching from nonintegrated platforms to a completely integrated platform such as, GreenRope. 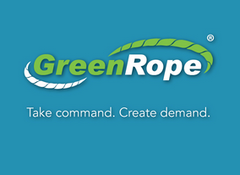 GreenRope streamlines their marketing processes to make them more effective, reach more people in the San Diego community, and boost event attendance.. GreenRope allows the SD AMA team to collaborate and effectively increase membership and turbocharge their events. "We are excited to see the SD AMA grow with GreenRope," says Marketing Director Alessandra Ceresa. "Establishing solid partnerships like this inspire collaborative efforts, and help us drive more attention to the San Diego business community."